We have been busy with quite a few kitchen & bathroom renovations over the past few months. Here’s a close look at one of our kitchen remodels we recently completed for our client, Dawn. It was a pleasure working with Dawn, and we are so pleased with the finished result. We didn’t need to change much about the layout of this kitchen. We relocated the fridge to make room for a double oven, and relocated the sink from the corner of the peninsula to the center. 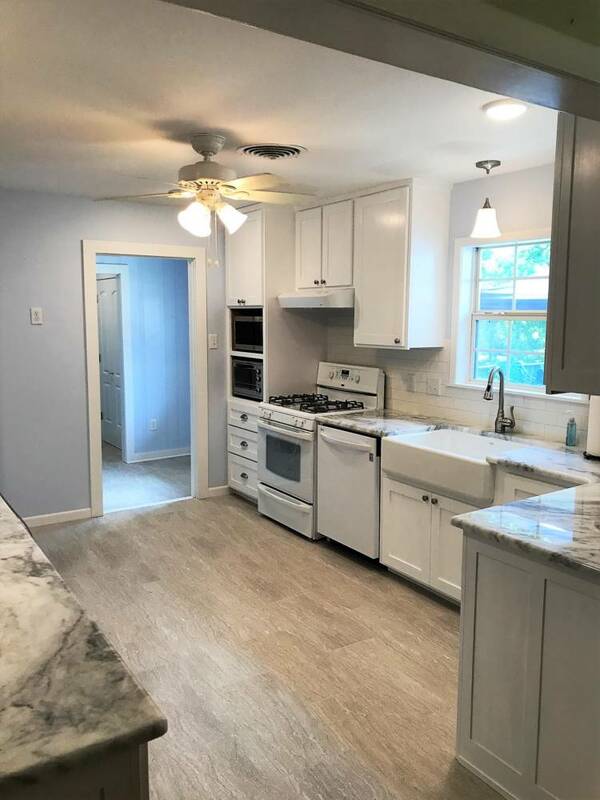 We replaced the existing cabinets with new custom cabinets, floating shelves, appliances, paint, flooring, granite counters, new fixtures, and a custom vent hood. Dawn chose a leather finish for her granite counters, which gives it a more natural stone look. Traditionally, granite is smoothly finished and has a glossy sheen. The leather finish provides a matte look with a slightly rough texture. It almost feels like a hybrid between traditional granite & concrete, and is a great compromise for homeowners who are wanting a concrete look without it feeling too industrial. We love the way it looks in Dawn’s kitchen with the other natural elements she chose. As a carpentry company, we like to bring unique elements of custom carpentry to all of our remodels. We constructed Dawn’s vent hood & floating shelves out of common pine. 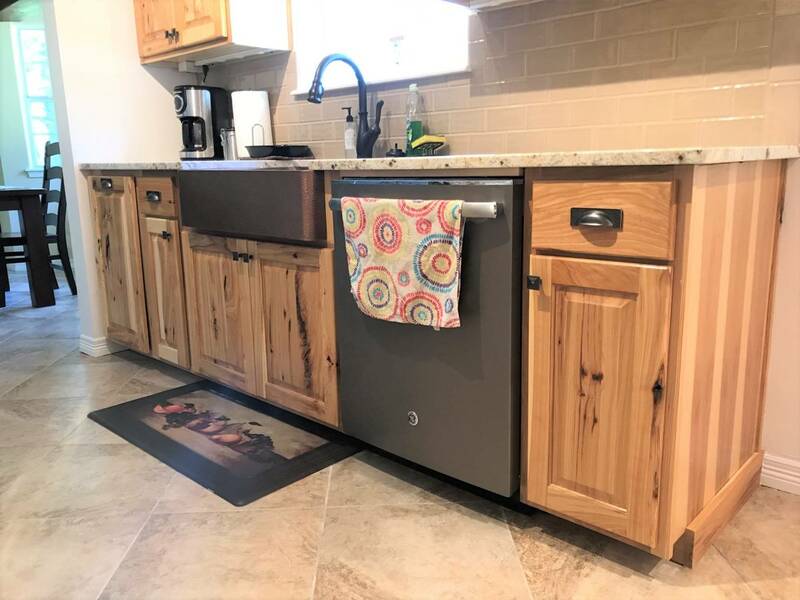 While this type of wood is not typically used for staining, we wanted to use a type of wood that would only hold stain on certain parts of the grain, in order to accentuate the texture. Dawn loved the look of the sample we created, and I think the end result is a perfect contrast to the gray & white color palate in the rest of her kitchen. Have a look at Dawn’s kitchen! We also updated Dawn’s fireplace to keep with the style of her new kitchen. We replaced the outdated wood & tile with painted brick and built a custom mantle out of knotty alder wood. Dawn’s vision for her kitchen turned out beautifully, and we are thankful for the opportunity to help her create a space she loves! Renovations continued smoothly at Andy & Carole’s home. Week three began with the installation and grouting of their tumbled marble back splash. Tumbled marble is exactly what it sounds like: large pieces of marble have been broken apart, then placed in a large drum along with grit, crushed stones, water, and large pieces of cement. As the drum spins, the elements inside tumble, creating holes and cracks in the marble, bringing out the natural beauty of the stone. I love the way the tumbled marble adds another natural element to their kitchen. It looks modern with a rustic twist, and really ties together the sage green cabinets and butcher block counter tops seamlessly. For the south side of the kitchen we went with a more simple, white washed, wood plank back splash. Since this side of the kitchen is a dry area, a completely water proof back splash was not necessary. The cabinets are also more shallow than the other side of the kitchen, so a thinner back splash allowed for more prep space, and helped keep costs down by not using as much stone material. Throughout the week we kept adding clear coats to the counter tops to keep them water tight. Between each coat we sanded lightly to make sure the next coat would stick. I love how the color and sheen of the counters turned out. Buck also created some floating butcher block shelves in the corner of the kitchen. (Step by step post to follow). Andy & Carole were hoping for open shelving in the corner, and wanted it to stand out rather than blend in with the rest of the cabinets. We were able to use some of the scrap material from the counters to wrap their shelves and give this custom look. The vent hood and new gas range were installed on the east side of the kitchen, and the dishwasher and a french door oven were installed on the north side. We also installed the beautiful chrome faucet in the wall above the farm sink. With the back splash installed, counter tops sealed, and most of the appliances installed, it is finally looking like a functional kitchen again! We love the way Andy & Carole’s design came together, and are so pleased with a smooth and beautiful kitchen remodel. Stay tuned for a step-by-step post of our floating butcher block shelves, and some final pictures of their completed kitchen! http://buckthebuilder.com/wp-content/uploads/2016/01/buck-logo-left-with-text-margin-300x98.png 0 0 Buck Hogue http://buckthebuilder.com/wp-content/uploads/2016/01/buck-logo-left-with-text-margin-300x98.png Buck Hogue2016-02-22 10:44:372016-02-22 10:49:50Kitchen Remodel: Week 3!